Each cut vinyl decal, paint stencil, heat transfer is a hand made unique item custom made to order and can be configured in lots of different ways. We have tried to include most of the basic options for each decal, stencil or transfer based on the what people are ordering. Not all options are listed nor available for every item and ask that you contact us with any decal, stencil or transfer questions you may have prior to ordering. Once your item is made there are no refunds. Choosing a Size - When choosing the size of your decal, stencil or heat transfer you will be choosing the longer side of the designs width or height, the opposite adjusts automatically keeping the designs aspect/look. Permanent - Refers to the adhesive strength. 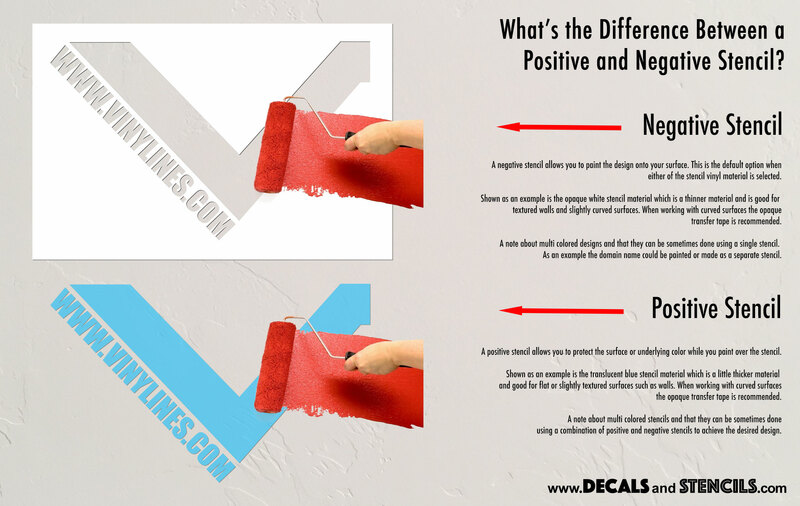 Decals and stencils can be removed with effort and the possible use of a solvent when necessary. This is the default when ordering decals. Removable - Refers to the adhesive strength. This material removes cleanly and easily for up to 2-years after application and has a matte surface that suppresses unwanted reflection. This vinyl material is an ideal choice for in home and any temporary, short to medium term indoor use. Great for trade-shows, displays and exhibitions. Paint stencils also use a similar removable adhesive and have a matte finish but is made for painting. Stencil Material - Paint stencils use a similar removable adhesive to decals and also have a matte finish but is made for painting. Heat Transfer Material - This material transfer via heat to t-shirts and other cloth like items. Make as Positive Stencil - This optional choice will convert the design into a positive paint stencil using a special vinyl material that can easily be removed after painting. As a positive paint stencil you will apply the stencil to the surface and then paint over it leaving the surface underneath unpainted. Paint is permanent, if your looking for something long lasting that and can be removed at a later time order as a decal. Make as Negative Stencil - This is the default option for a paint stencil allowing you to paint the design onto your surface. Paint is permanent, if your looking for something long lasting that and can be removed at a later time order as a decal. Limited Availability Vinyl - We have a limited quantity of some vinyl materials. Some of these materials may cost more and the added charge will be made available via email. Contact us prior to ordering with any questions. Special Order Vinyl - Vinyl material needing to be special ordered. There is a minimum $25 charge for ordering the material and some materials may incur additional charges based on quantity needed and cost of the material. Contact us prior to ordering with any questions. 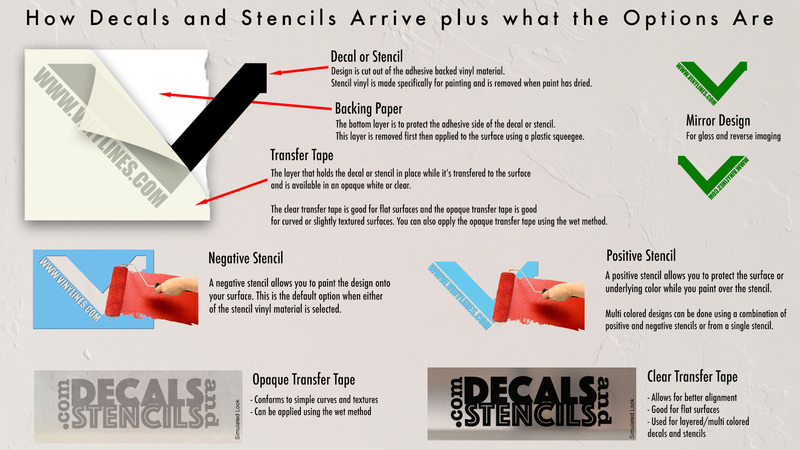 Opaque Transfer Tape - Default transfer tape material for all single color decals and paint stencils. Good for curved surfaces and wet application method. This is also preferred transfer tape for wall decals as well as large decals as it makes it more rigid and easier to apply and work with. No Transfer Tape - Only for solid decals and wet or wrap application method. There are special instances when a decal might be easier to apply without transfer tape. Heat transfers also do not include transfer tape as they are released from the carrier sheet when heated and we use the silicone coated backing paper from decals and stencils to protect the transfer during shipping and when not ordering it applied to a t-shirt etc..
Mirror Design - Design is flipped and good when placing a decal on the inside of window for viewing outside. Not available with all vinyl material or when making color layered decals. Designs that are symmetrical do not need to be mirrored. When ordering heat transfers the design is mirrored by default in order to transfer to the surface.